1In March 2014 I published an article on this blog titled "Stauffer Miscellanea". Because my archival research is always continuing, several discoveries have occurred during the last year that add to our knowledge concerning Stauffer's business practices. Archival sources show that Stauffer had an ingenious way of eliciting money from gullible people. It seems that he was constantly on the lookout to find trusting investors whom he could part from their hard-earned savings. Since he channelled the money into his high-flying, but notoriously unsuccessful inventions, these investments never yielded any profit and Stauffer slowly acquired the reputation of a habitual debtor. The following two cases are particularly typical. 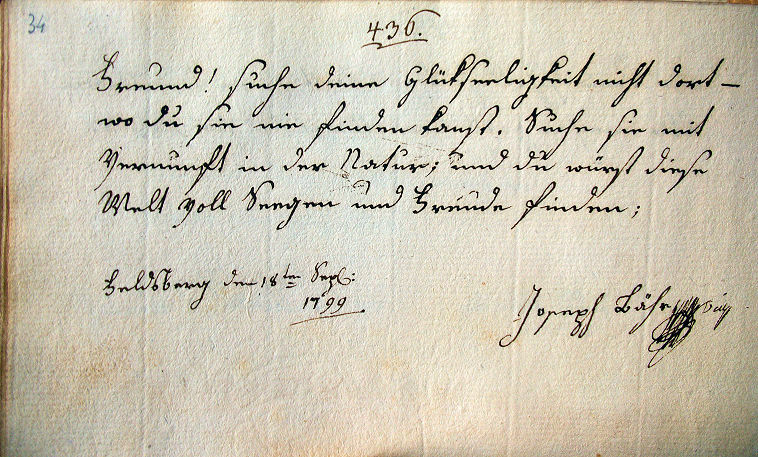 The note in Joseph Bähr's probate records concerning his business contract with Stauffer and his wife (A-Wsa, Mag. ZG, A2, 1458/1819, fol. 10r). Bähr's investment was first published in 1973 by Karl Maria Pisarowitz. The literature on Joseph Bähr is flawed, because neither Pisarowitz nor Grünsteudel did on the spot archival research in Vienna. Anmerkung. Diese Post ist ganz uneinbringlich, zumahl den Stauferschen Eheleuten erst kürzlich Schulden halber ihr ganzes Mobilar-Vermögen mit gerichtlicher Pfändung belegt wurde. 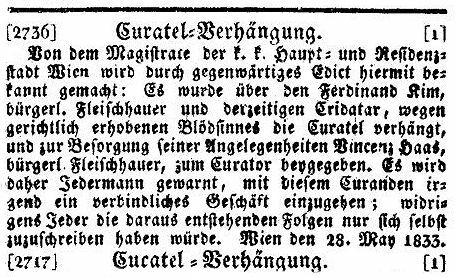 By virtue of a company agreement between the testator and the citizen lute and violin maker Johann Georg Staufer and his wife Josepha, dated 14 November 1816 these two owe 2,910 gulden in guitars that are to be produced. Note. This asset is totally uncollectible, especially since all movable assets of the Staufer couple were recently seized by the court. The sources show that Bähr – who in 1800 had taken part in the premiere of Beethoven's septet op. 20 – could afford to give most of his assets to Stauffer, because his wife Susanna had inherited a significant sum from her father Paul Prem. When Prem, a wig-maker from Sellrain in Tyrol, died on 21 September 1796, his estate was estimated at 10,269 gulden and some of these assets still appear (albeit massively reduced by the 1811 state bankruptcy) in the probate records of his daughter Susanna Bähr who died on 12 June 1821 at an age of thirty-nine. The preservation of Susanna Bähr's inheritance was possible, because she had no children and received a pension from the Tonkünstler-Sozietät. The lifetime savings of Joseph Bähr however were lost to the predatory debtor Johann Georg Stauffer. 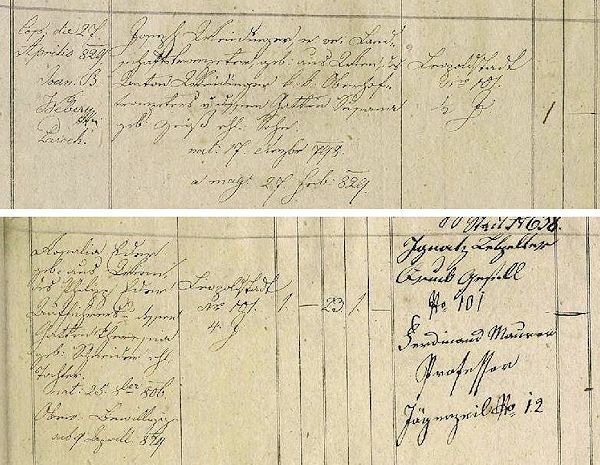 Neither Pisarowitz nor Grünsteudel were able to locate Joseph Bähr's baptismal entry in the Wallerstein church records. Pisarowitz writes: "Here his baptismal entry was evidently immatrikuliter forgotten!". Grünsteudel states: "There is no son named 'Franz[sic] Joseph' among the nine baptisms of children of the baker Andreas Beer." The entry in the minutes of the Tonkünstler-Sozietät concerning Joseph Bähr's joining on 12 May 1803 (the date given by Pohl is wrong) shows that Bähr was not born in Wallerstein, but on 19 February 1770 in Deiningen. 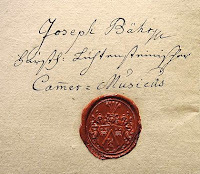 The entry in the minutes of the Tonkünstler-Sozietät concerning Joseph Bähr's joining on 12 May 1803 (A-Wsa, Private Institutionen, Haydn-Verein, A2/2). The literature on Viennese musicians of Beethoven's time is still marred by the fact that many researchers rely on Pohl's flawed 1871 book instead of consulting the original archival material of the Tonküntler-Sozietät. Joseph Baer Clarinetist / beÿ Loui[s] v. Lichtenstein / bittet um die Aufnahme in die / Sozietaet. Er ist gebohren / d[en] 19ten Febr[uar] 1770 in Deiningen. Fiat. 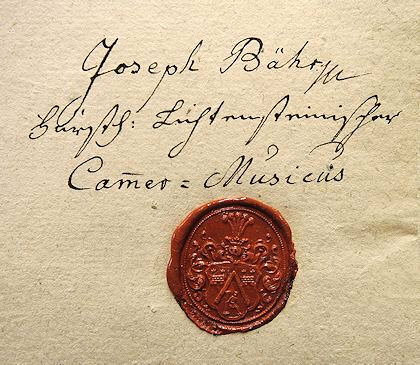 Joseph Baer clarinetist with Count Loui[s] v. Lichtenstein requests to be accepted into the society. He is born on February 19th, 1770 in Deiningen. Fiat. Friend! Do not seek happiness where you can never find it. Ferdinand Johann Kimm was born on 11 December 1779 in the village of Oberdöbling, son of the butcher Ferdinand Kimm and his wife Maria Anna, née Ecker. Kimm took up his father's (and his grandfather's) profession, became a well-to-do butcher like his father (who owned the houses Neubau 258 and later Neubau 80) and settled in Gumpendorf, where he bought the house No. 74 (today Brückengasse 14). On 25 November 1805 he married his second cousin Katharina Batzl (born 11 August 1782), the daughter of a retired butcher and house-owner in the (at that time) Lower Austrian village of Weinhaus. On 13 February 1807 Ferdinand Kimm took the oath as "Wiener Bürger". The entry concerning the baptism of Carolina Weidinger with "Katharina Kim Fleischhauerin Laimgrube N° 28" as godmother (Altlerchenfeld, Tom. 6, fol. 319). The house Laimgrube 28 (today Linke Wienzeile 12) had been bought by Kimm in 1819. Even in 1849, almost fourteen years after her husband's death, Katharina Kimm still served as godmother of Anton Weidinger's grandson Ferdinand Rudolph Alois Weidinger (the future cellist) who was born on 22 September 1849. 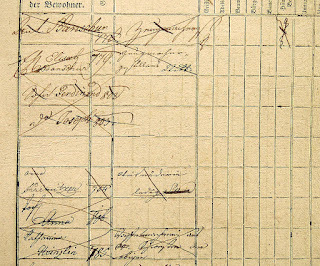 The entry concerning Ferdinand Weidinger's baptism on 24 September 1849 (Maria Treu, Tom. 26, fol. 82). The entry "Fleischhauersgattin" should read "Fleischhauerswitwe". Around 1825 Ferdinand Kimm purchased the house Laimgrube 146, "Zur Goldenen Sonne" ("At the Golden Sun", today Gumpendorfer Straße 46). This may have brought him into contact with the family of the glover August Jahns, Joseph Lanner's future father-in-law, who lived right opposite Kimm's house, at Laimgrube 97, "Zum Rothen Hahn" ("At the Red Rooster", today Gumpendorfer Straße 47). The houses Laimgrube 146 and 97 opposite each other on the Kothgasse (today's Gumpendorfer Straße) circled in red and Windmühle 28, Katti Lanner's place of birth, circled in blue. After his first marriage attempt with an innkeeper's daughter had failed, Lanner on 24 November 1828 married his childhood friend Franziska Jahns. For about a year the couple lived in Lanner's apartment at Windmühle 28 ("Drey Hacken", today Windmühlgasse 7) where on 14 September 1829 their first child was born and christened Katharina Josepha on the following day at the parish church of St. Joseph ob der Laimgrube. Katharina Kimm served a godmother of Lanner's third (and first legitimate) child. 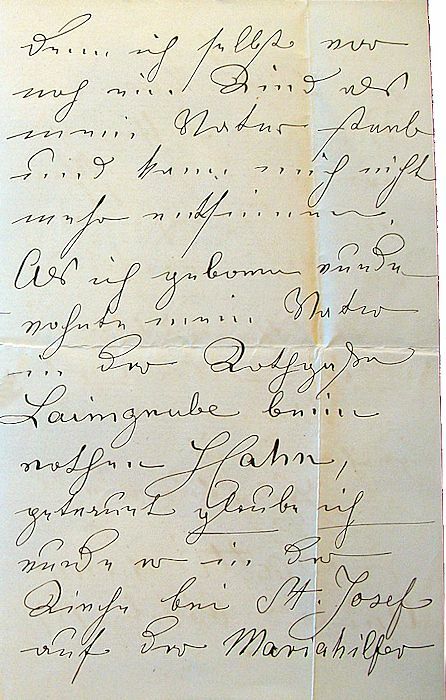 The entry concerning the baptism of Joseph Lanner's daughter Katharina Josepha on 15 September 1829 with Katharina Kimm's signature as godmother. The words "Fleischhauers Gattin Laimgrube N 146" were added by the officiating priest Thomas Hitzinger (St. Josef ob der Laimgrube, Tom. 18, fol. 160). 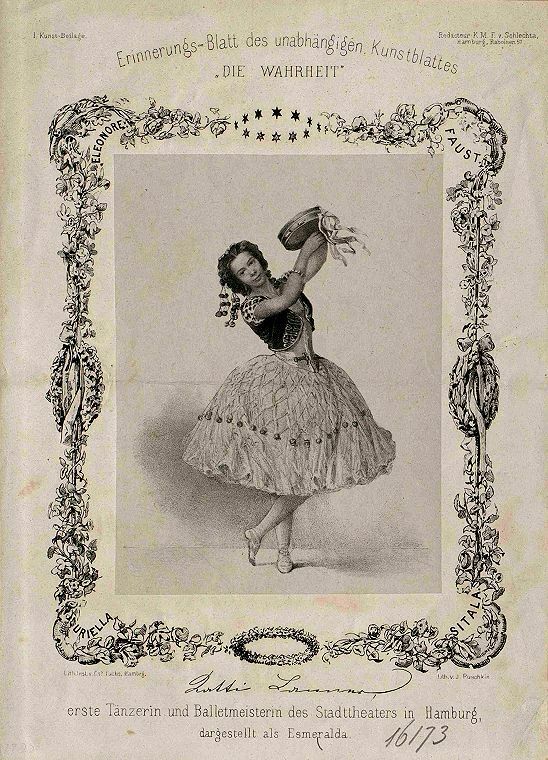 Katharina Lanner, who described herself as "dancing disciple of Taglioni's and Fanny Elßler's school", debuted in 1843 at the Kärntnertortheater where for ten years she was to be the darling of the audience. She became a famous ballerina and toured all over Europe. Katti Lanner as Esmeralda in a performance of Pugni's ballet at the Hamburg Stadttheater. Her other famous roles are written into the corners of the decorative frame (A-Wn, PORT_00006911_01). 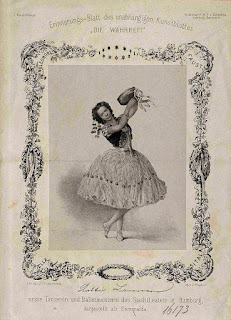 In 1872 Katti Lanner gave a guest performance in New York and in 1875 settled in London where she retired as directress of "Her Majesty's" Ballet Troupe at the National Training School for Dancing. Katti Lanner did not know the exact address of her place of birth. When Josef Wimmer asked her in 1878, she misremembered and mixed up the house Windmühle 28 (where she was born) with the house "Zum Rothen Hahn", Laimgrube 97: "denn ich selbst war noch ein Kind als mein Vater starb und kann mich nicht mehr entsinnen. Als ich geboren wurde wohnte mein Vater in der Kothgaße Laimgrube beim rothen Hahn" ("I was still a child when my father died and cannot remember. When I was born my father lived in the Kothgasse on the Laimgrube at the Red Rooster"). 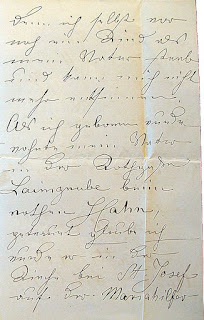 Katti Lanner misremembering her place of birth in a letter written on 10 October 1878 to Josef Wimmer (A-Wst, H.I.N. 20137/1). Joseph and Franziska Lanner with their first child "Tocht[er] Catharina 829" on an 1830 conscription sheet of Windmühle 28. Note Lanner's date of birth being given as "12 April 801" (A-Wsa, Konskriptionsamt, Windmühle 28/60r). The latest literature on Lanner's Viennese residences (mostly written by Herbert Krenn and Helmut Kretschmer) is a curious mixture of oversights and errors. Before July 1830 Lanner moved to Laimgrube 97 which is proved by the birth of his son Joseph Ferdinand on 23 July 1830 in this house. As the child's godfather signed "Anton Kimm, bügl. Fleischhauer Meisters Sohn Laimgrube Nro 146". Ferdinand Kimm's son Anton had been born on 7 June 1813 in Gumpendorf (Gumpendorf, Tom. 16, fol. 41). By 1830 he was his parents' fourth eldest child and like his elder brother Ferdinand (b. 1806) he also became a butcher. He was to die on 18 July 1866 (St. Josef ob der Laimgrube, Tom. 14, fol. 206). 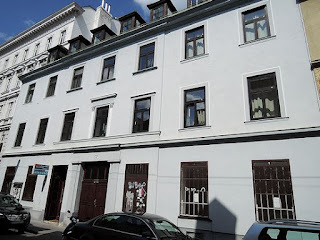 The baby boy Joseph Lanner was put into care with the shoemaker Johann Glatzl and his wife Eleonore at Altlerchenfeld 209 (today Lerchenfelder Straße 129) where he already died on 6 February 1831 of hydrocephalus (A-Wsa, TBP 169, lit. L, fol. 3v). This baptism was the last documented contact between the Lanner and the Kimm families. The godparents of Lanner's four later children were the cafe owner Augustin Corti (dedicatee of Lanner's "Paradies Soirée Walzer" op. 52) and Corti's mother Franziska Corti, née Hofmann. There is yet another, hidden connection between Katharina Kimm and Joseph Lanner of which none of the people involved probably ever became aware: on 16 February 1817 Katharina Kimm's father Ambros Batzl served as best man at the wedding of the grocer Wolfgang Kraus (Weinhaus, Tom. 2, fol. 52) whose daughter Marie Kraus, around 1838, became Lanner's mistress and in 1843 bore Lanner's posthumous son Carl Joseph Maria (Lorenz, 2006/07). Ferdinand Kimm was a successful butcher and a relatively wealthy man who had enough money to invest in promising enterprises. His probate papers show that already in January 1820 he invested 15,000 gulden Viennese Currency into Joseph Danhauser's furniture factory. When his father Ferdinand Kimm died on 9 February 1831 at the age of 84, he came into possession of even more money. The house Neubau 80 alone was estimated at 19,500 gulden and Ferdinand also got back the 4,000 gulden that he had lent his father. Katharina Kimm's testimony shows that, in order to calm down Katharina Kimm, Stauffer already at that time applied the white lie that her husband had only signed as witness and that the statement E in question was given to Katharina Kimm and not her husband to calm her down. Regarding question 18 the witness Johann Mayer claims that the fact, that, while Kimm's wife was arguing with Stauffer, Ferdinand Kimm stepped on Stauffer's foot and requested him through signs to leave her alone, points to an agreement between Stauffer and Kimm concerning the appeasement of Katharina Kimm. Kimm lost the lawsuit, but he was able to save the family house on the Laimgrube which already in 1830 had been transferred into his wife's property. In his probate file he is described as "gewes. Hausinhaber" (former house owner). Ferdinand Kimm's condition with the word "gewes." inserted before his state as "Hausinhaber" (A-Wsa, Mag. ZG, A2, 6919/1835). The handwriting is that of Anton Slabe (1787-1860) who is mainly known for having been the Sperrskommissär of Franz Schubert's estate. After the loss of the lawsuit, Katharina Kimm decided that she had enough. On 1 May 1833 she submitted an official petition to the civil court of the Vienna Magistracy to have her husband declared legally insane and to have him put under the guardianship of his son-in-law, the butcher Vincenz Haas. Since her petition is of great historical interest and provides a much better description of the course of events than the records related to the preceding lawsuit, it is presented here in its entirety. According to the medical certificate A. my husband, the civil butcher Ferdinand Kimm, is suffering from one of the gravest illnesses, from kidney stones. About 9 or 10 years ago the first heavy onset occurred which for a time of eight days put him between life and death, and made him bedridden for 15 days. This first onset was followed by almost annual, equally severe onsets which for 5 or 6 years have been accompanied by new devastating bouts, such as inflammations that multiplied in number and severity in such a way that my husband has been mostly bedridden for the last two years. The result of this illness and the accompanying sufferings was a significant decline of my husband's mental capacities which according to the above-mentioned certificate A, in the course of several years, has reached a point that my husband is utterly unable to estimate and judge the results of ordinary actions and enterprises. In order to explain the medical certificate concerning the point of insanity, I take the liberty to only mention a few of the unfortunately large number of facts which characterize the state of my husband's mental powers. When we built the rear part of our house, the construction, which had already advanced significantly, collapsed. The investigation revealed that there had been no adequate foundations. Therefore a strong wall was erected in the cellar on which the construction was continued and completed. In the year 1827 my husband proceeded to have this wall torn down again. All my protests were in vain and only our son-in-law, the civil master butcher Mr. Vincenz Haas, who also signed this petition, succeeded in keeping him from the realisation of this plan which may have led to the unavoidable collapse of the whole building. In the ice cellar there is an indentation in the form of a well which serves the purpose of absorbing the water that is released from the ice. Such an indentation is always carefully sealed with clay to prevent the access of spring water that may be in the ground, – because its different state of temperature has a negative effect on the temperature of the cellar; hence these indentations are designed as shallow as possible. When I was in Baden in 1828, my husband hired people and had this indentation, which fully served its purpose, regardless of the water level of the nearby fountain, dug up so deep that a rich water vein was opened which quickly flooded the whole ice cellar. Only with great efforts and high expenses it was possible to remove the water and to fill up the pit that had been dug. A full restoration of the cellar was not even possible, because the stonework had taken significant damage from the water. My undersigned son-in-law also confirms this fact. One year later, towards the end of winter, he had 8 to 10 loads of ice transported, and, in spite of my protest, had it put into a storage room on the ground floor of our house. That the ice, because of the ensuing mild weather, soon melted and flooded the yard and the doorway would have been the least, but a significant drawback was the damage that the water had done to the walls of the shop. Beside our children and the aforementioned son-in-law this fact is also known to the civil master tailor Joseph Huwerth, who, for this reason, has also signed the present petition. In our house a lot of rosaries, prayer books, pictures of saints, tobacco boxes, tobacco pipes and sticks can be found and in general all kinds of things that are offered at small stalls in the streets, everything of the lowest and worst kind and totally worthless. All these items were bought by my husband, at prices about which one would want to throw the hands up in despair. Once he brought home a coffee table cloth for which he had paid 50 gulden and which was not even worth 25 Groschen. If somebody approaches him, especially if he is an acquaintance, or can really lament, he can be sure to receive everything that he is carrying on him. Because of this and because of his irrepressible passion for buying worthless things, I have established the custom among the children that, as soon as he is about to go out, one or the other is ready to accompany him. Unfortunately he only too often was able to fool my and the children's attention and sneaked away from the house alone. With a sad heart I have to say that in such a case the children already laugh as soon as they see him coming home, because they can count on some worthless purchase to be unpacked and praised. His bill transactions with the scheming Jew Fanny Wellisch and the habitual debtor Georg Stauffer, which eventually led to his bankruptcy, belong to the same line of events. Never in his life my husband has signed a bill of exchange and he never ever knew anything about such bills. For my purpose it is not worth the effort to investigate what those bills of exchange were all about; it is beyond doubt that Fanny Wellisch, who lives on the charity of her relatives, and Georg Stauffer, who is a habitual inmate of the debtors' prison, or is at least in constant danger of winding up there, are definitely not the people, for whom a man, who is in control of himself, would accept or sign bills of exchange, or contract any obligations at all. Since the declaration of bankruptcy, his physical ailments have increased and his health has worsened like his mental powers. In the winter before last, during the hardest frost, he had water sprayed in front of the house which of course immediately resulted in a layer of ice and almost caused unpleasant conflicts. Everybody knows that horses that are heated have to be let cool down before they are washed or given water. Last summer our horses returned steaming from their hard work. On my husband's command the servant immediately had to wash them, because this would have done them very good. The next day both of them were stiff as was to be expected and they remained stiff in spite of all applied remedies. I have to witness such events in the house on a daily basis and especially in his behavior towards the children, even towards the ones he liked best. It would hurt me too much to go into details in regards of this behavior. I would have observed the strictest silence concerning the unfortunate state of his mental powers anyway, – however a series of important observations now come to mind, the worry alone, what mischief he could cause, if in the case of my death he would be put into paternal power under the premise of having a sane mind, would justify my request to have him declared legally insane. 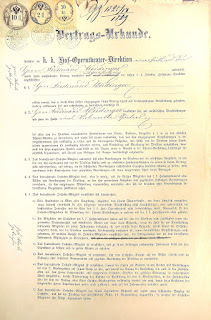 In confirmation of the correctness of the described facts all our full-aged children, as well as our son-in-law Vincenz Haas and the civil master tailor Mr. Joseph Huwerth, who is well acquainted with our family, have signed the present petition; even my husband agrees with my application and has therefore signed it. As guardian I propose my son-in-law Mr. Vincenz Haas who has run the business on commission of the bankrupt's estate and who declares with his signature to be willing to accept this appointment. The honorable Magistracy may deign to put my husband, the civil master butcher Ferdinand Kimm at Laimgrube N° 146 under guardianship owing to legal insanity and to appoint the civil butcher Vincenz Haas in Mariahilf N° as his guardian. On 28 May 1833 Ferdinand Kimm was officially declared legally insane and on 14 June 1833 the edict was published in the Wiener Zeitung. Ferdinand Kimm died of a stroke on 4 December 1835 at 11 p.m. and was buried two days later in the Schmelz cemetery. He was survived by his wife and seven children of whom three were of legal age. According to Kimm's probate file he had been unable to run his business for several years and with the permission of the Magistracy had given all his furniture and the butchery equipment to his wife. A part of his clothes had been sold to cover the expenses of the treatment of his long and complicated illness, the rest had been given away. His main asset was the house Neubau 80 that he had inherited from his father which was estimated at 19,500 gulden. Because his son Ferdinand owned a share of 4,000 gulden of this house, Kimm's estate amounted to 15,500 gulden WW (Viennese Currency), a sum that was divided among Kimm's three nephews, one niece and his seven children. Owing to the bankruptcy of the furniture manufacturer Joseph Danhauser (an event that is totally ignored by the Danhauser literature), the amount of 15,000 gulden WW (6,000 gulden CM) that Kimm in 1820 had invested into Danhauser's furniture factory was uncollectible. Katti Lanner's godmother Katharina Kimm, whose common sense had basically saved the Kimm family from total bankruptcy, died of old age on 6 May 1863 at Gumpendorfer Straße 54 where her son Anton had re-established his father's butchery. Unfortunately only one leaf of her probate papers survived. It is an "Einantwortungs-Urkunde" (a certificate of handing in) from 1880 of a part of Katharina Kimm's inheritance to her last surviving son Ferdinand and his two children (A-Wsa, BG Mariahilf, A4, 835/1863). Johann Georg Stauffer in 1833 was able to temporarily extract himself from his financial difficulties by resigning from his business and transferring his license in 1836 to his son Anton. Of course Stauffer's financial problems were not over. In 1839 they caused him to temporarily move to the (at that time) Hungarian town of Kaschau (A-Wsa, Konskriptionsamt, Passprotokoll B4/28, fol. 142). But this is a different story. Grünsteudel, Günther. 2007. "'Bähr blies wie ein Gott' – Der Klarinettist Franz Joseph Beer (1770–1819)". Rohrblatt 23, 151-57. Lorenz, Michael. 2006/07. "Familie Trampusch - geliebt und totgeschwiegen", Jahrbuch des Vereins für Geschichte der Stadt Wien, Vol. 62/63, 2006/2007, (Vienna: Verein für Geschichte der Stadt Wien), 135-49. –––––––. 2015. "Six More Unknown Godchildren of Joseph Haydn" (Vienna: Internet publication). Pisarowitz, Karl Maria. 1973. "Der Bär, den man uns aufband. Differenzierungen ewig Verwechselter". Acta Mozartiana 20, 62–67. Pohl, Carl Friedrich. 1871. Denkschrift aus Anlass des hundertjährigen Bestehens der Tonkünstler-Societät. Vienna: Selbstverlag des "Haydn". After long negotiations, the German actor August Wilhelm Iffland was engaged to appear in sixteen roles at the two Viennese court theaters in June 1801. For his four-week guest appearance Iffland was paid the astonishing sum of 1,500 thalers. Owing to the political situation and the severe Austrian censorship, the plays he appeared in were all of minor significance, written by Kotzebue, Gemmingen, Schröder, Cumberland, Sheridan, Mercier and Iffland himself. When exactly Iffland left Vienna, has previously been unknown, but the day of his departure can be verified with an unpublished entry that he left on 23 July 1801 in the album of the blind pianist Maria Theresia Paradis (A-Wst, H.I.N. 92659, p. 73). Es ist der Weg des stillen / Verdienstes der zur Zu / friedenheit führt. Ihre / sanfte Seele wird sie / erwerben, wenn Ihr glän / zendes Verdienst, Ihnen / nicht von sich schon jede Freude / entgegenführen müßte. Vienna, July 23rd, 1801 – in the din of departure when he was still allowed to admire the humble art. The fact that Johann Wolfgang von Goethe neither replied to the package of Schubert Lieder that Joseph von Spaun sent him on 17 April 1816, nor to Schubert's dedication of the three songs op. 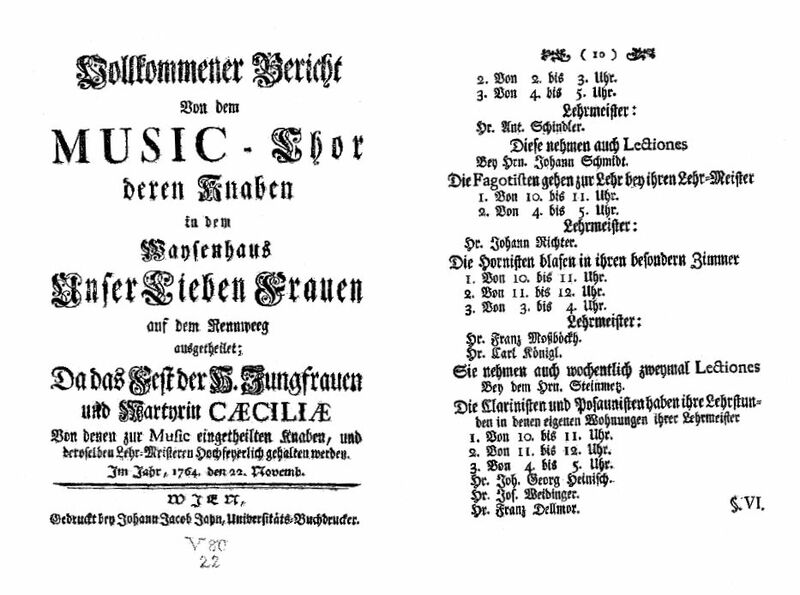 19 in June 1825, has always been taken as proof that, because Goethe's musical taste was under the influence of Zelter and Reichardt, the poet was simply unable to acknowledge Schubert's genius. Time and again the public takes pleasure in being told this story, because it gives every lover of Schubert's songs the feeling of having a better musical taste than the German prince of poets. This phenomenon became especially apparent during a concert, given on 27 March 2014 by the singer Julian Prégardien and some of his friends at the Hans-Huber hall of the Stadtcasino Basel. This concert was titled "Schubertiade" and presented a "Schubertiad as it actually might have been". Accordingly, it was broadcast by several radio stations as "Julian Prégardien and friends with a fictitious Schubertiad". The program included various Schubert songs, interspersed with instrumental pieces by Schubert, Matiegka and Mertz. Prégardien also recited poetry and at one point recounted the story of how Goethe ignored the music that was sent to him by Spaun and Schubert. 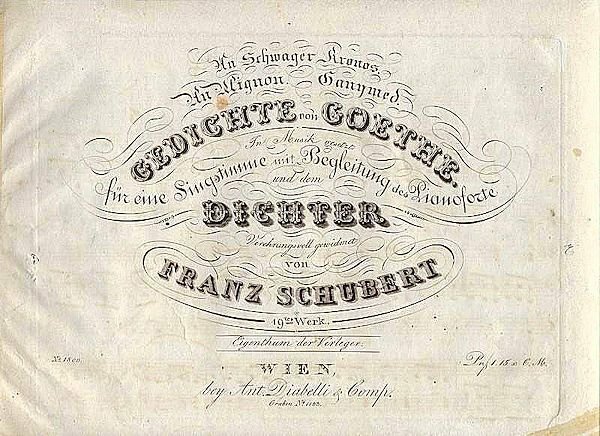 One could almost see the audience revelling in the feeling of being true connoisseurs of Schubert's music and delightfully enjoying the fact that, unlike the evidently ignorant Goethe, they are able to appreciate Schubert's genius. As I see from these letters, Solger had a lot of love for me; in one of them he complains that I did not even answer him concerning the "Sophokles" he sent me. Dear God! – But as it happens with me! There is nothing to wonder about. I knew great men who received a lot of mail. They made themselves certain forms and expressions which they used to to respond to everything and they wrote hundreds of letters which were all alike and all were empty phrase. This was never my thing. If I could not tell someone something special and appropriate, as the particular issue demanded, I preferred to write not at all. Superficial phrases I considered unworthy, and thus it came to be that I could not answer many an honest man whom I would have liked to have written. You can see for yourself what is going on at my place and what kind of shipments arrive every day from every corner of the world. And you must admit that it would need more than one human lifetime if one would like to respond to everything just briefly. In an article titled "Three Unknown Godchildren of Joseph Haydn", which I published in September 2014 on this blog, I dealt with Haydn's role as a multiple godfather and how this role documents his social relations with relatives, friends and colleagues. I presented a list of Haydn's known godchildren and pointed out that "this list is neither definite nor complete and if necessary, will be corrected or extended in the future". In the course of my continuing research on Haydn's Viennese friends I had to realize that very little seems to have been done in this particular field. While research on Mozart's Viennese circle has never received appropriate attention, the situation concerning Haydn's is even worse. This seems to be caused by the lack of a scholarly institution in Vienna that is exclusively dedicated to Haydn research. Six children of the court trumpeter Anton Weidinger, for whom Haydn in 1796 wrote his trumpet concerto Hob.VIIe:1, were godchildren of Haydn. That this has not become known until now may come as a surprise, but the surprise is lessened by the fact that the last person who delved into Weidinger's private life was Richard Heuberger who in 1907 had a conversation with Anna Weidinger (1855-1911), the widow of Weidinger's grandson Ferdinand Weidinger (1849-1898). Heuberger published the results of his research in the article "Anton Weidinger. Biographische Skizze" (Die Musik, vol. 28, Berlin and Leipzig 1908). As of 1984, Makoto Ohmiya and Sonja Gerlach, the editors of the trumpet concerto for the Haydn Gesamtausgabe, were not even aware of Weidinger's correct year of birth, although it had already been published in 1886 in vol. 53 of Wurzbach's Lexikon. I shall not present a detailed biography of Anton Weidinger in this blogpost. 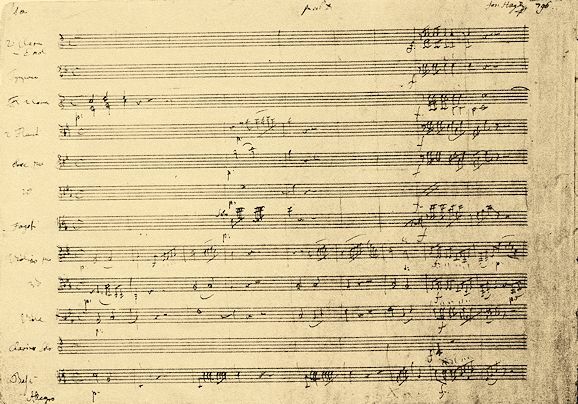 This extensive task should be done by Haydn scholars whose job it is to do this kind of work. I am going to present Haydn's six godchildren and a number of mostly unknown documents that shed light on their and their parents' lives. Anton Weidinger's second child Joseph was born on 17 December 1798 at St. Ulrich 105, "Zum Sterbenden Joseph", ("The Dying Joseph", last numbering 128, today Piaristengasse 23) and baptized in the presence of Joseph Haydn at the Piarist Church of Maria Treu. 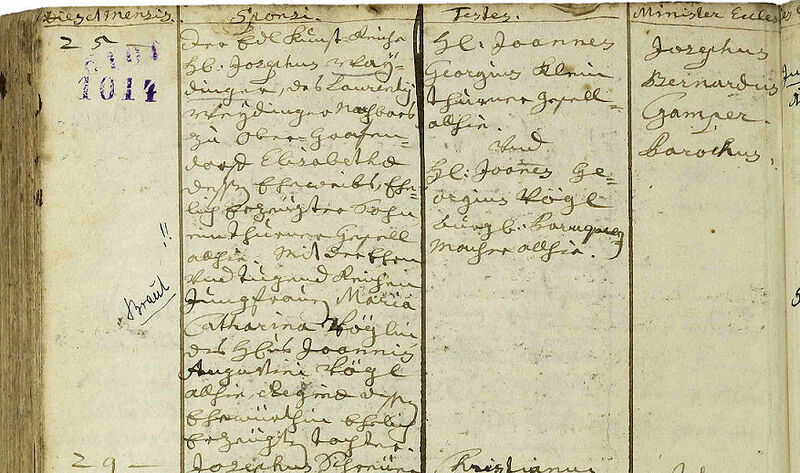 The entry concerning the baptism of Joseph Weidinger on 17 December 1798 (Maria Treu, Tom. 7, fol. 203). This and the following pictures show two-page entries with their two sections positioned above one another. The undersigned, who on his travels to the capitals of England and France raised universal cheer for the keyed trumpet that he had been the first to invent, has the honor of announcing to the high nobility and the honorable public that he has also invented a horn with keys which differs from the normal instrument of the same name in such a way that, just like on a string instrument, all half notes can be played in piano, crescendo, forte et cetera through 3 octaves in equal strength and in tune. –– His son, a pupil of his, a boy of 12 years, will have the honor of letting himself be heard on Sunday, the 28th of this month at noon in the small I. & R. Redoutensaal with a concerto that was newly composed for this organised horn. He dares to leave it to the impartial judgement of lovers and connoiseurs of musical art, as to what extent this instrument, owing to his invention, can be preferred to others of the same name and can claim to receive praise from the high nobility and the honorable public. The admission price is 2 fl Viennese Currency. Anton Weidinger, I. & R. Court trumpeter. In his 1993 thesis about Anton Weidinger, Andreas Lindner claims that this concert was repeated on 28 December 1813, but this claim is based on an error by Heuberger. Referring to Hanslick's Geschichte des Concertwesens Lindner also states that Joseph Weidinger already appeared at a concert in 1810, but there is no such information in Hanslick's book. As a matter of fact this information also originates from Heuberger, but this early concert appearance is still undocumented. 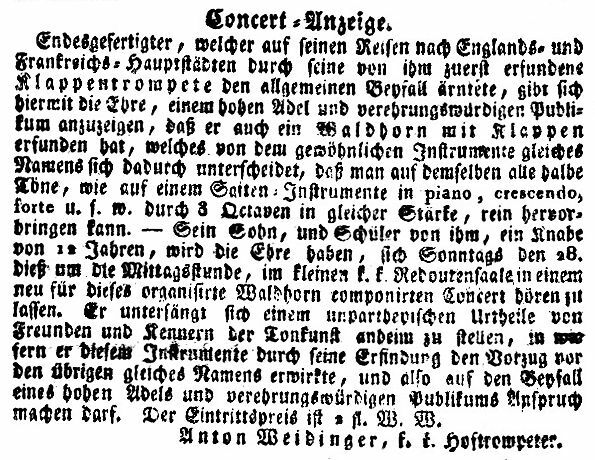 On 25 March 1817 Joseph Weidinger took part in a concert at the Josephstädter Theater for the benefit of its musical director Aloys Merk. He performed an Adagio and a Rondeau for the keyed horn, composed by Franz de Paula Roser (1779-1830). The review in the Wiener Allgemeine Musikalische Zeitung of 10 April especially praised Weidinger's execution of difficult trills. On 30 March 1817 Joseph Weidinger again appeared at a concert at the same theater, this time together with his father. The report in the AmZ praised the artists for "treating their instruments with special delicacy for which they were noisily called for." Father and son Weidinger again performed together on 4 May 1817 at the Kleiner Redouten-Saal. Matthias Franz Perth's entry in his diary concerning his attendance of the concert of father and son Weidinger on 4 May 1817: "Today at noon the k.k. court trumpeter Mr. Anton Weidinger gave a grand concert at the small Redoutensaal, where he let himself be heard on the keyed trumpet that he invented and his son on a newly invented keyed horn." (A-Wst, Perth, Tage-Buch, C H.I.N. 226988/30, p. 291). On this occasion we again had the opportunity to acknowledge the effect of the keyed horn and the keyed trumpet and to do justice to the skill of the inventor regarding the handling of his instrument during the performance. Whether the horn and the trumpet, because of the attached key, lose their original character and become similar to other instruments, without achieving the full range of scale, is a question we do not want to decide. The performer and his son played an Adagio and a Rondo, and a Potpourri from Tancredi, all of which were arranged by Franz Roser, with applause that was also given to the artists and amateurs who had the kindness to take over the singing and declamation parts. The trumpet was represented by an excellent virtuoso, the court trumpeter Anton Weidinger, who from 1800 on became a steady figure in Viennese concert life and like Miss Auernhammer and the harpist Müller gave his annual concert at the Burgtheater, until in the 1820s his son Josef († 1832) took over from him, to take care of the artistic preservation of the keyed trumpet and the name Weidinger by giving an annual concert. A. Weidinger was the inventor of the keyed trumpet which he exclusively used in his concerts. There are still many announcements and reviews of Weidinger concerts to be found in Viennese newspapers. We have to keep in mind however that – just like the premiere of Haydn's trumpet concerto on 28 March 1800 – most of these concerts were very poorly attended. Around 1816 Joseph Weidinger was hired as trumpeter by the Lower Austrian Landstände. On 27 April 1829 he got married to Rosalia Eder, the daughter of Philipp Eder, a boatmen from Großrußbach. At the time of the wedding he was living at Leopoldstadt 101 (today Untere Augartenstraße 16). The bride was already five months pregnant. The entry concerning the wedding of the "n.oe. Landschaftstrompeter" Joseph Weidinger on 27 April 1829. The groom's best man, the "Musikdirektor" Ferdinand Maurer, was a nephew of Anton Weidinger's second wife (St. Leopold, Tom. 14, fol. 268). Right after his wedding Joseph Weidinger and his wife moved to Leopoldstadt No. 108 (today Untere Augartenstraße 22-24) where on 23 August 1829 their daughter Magdalena Josepha was born (St. Leopold, Tom. 22, fol. 159). 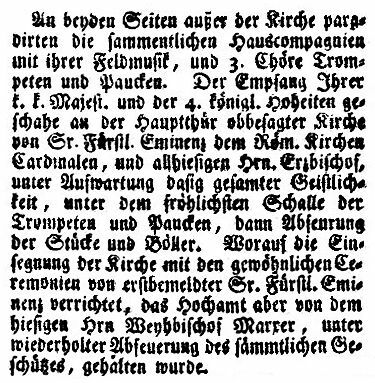 The godmother was Magdalena Weidinger, the widow of the child's greatuncle, the court trumpeter Joseph Weidinger, who had died on 24 February 1829 at the age of 74 (the date given in the literature is wrong) at his brother's earlier address St. Ulrich 128 (formerly 105) (Maria Treu, Tom. 9, fol. 132). The child Magdalena Weidinger already died on 8 September 1829 of "Fraisen" (St. Leopold, Tom. 8, fol. 256). 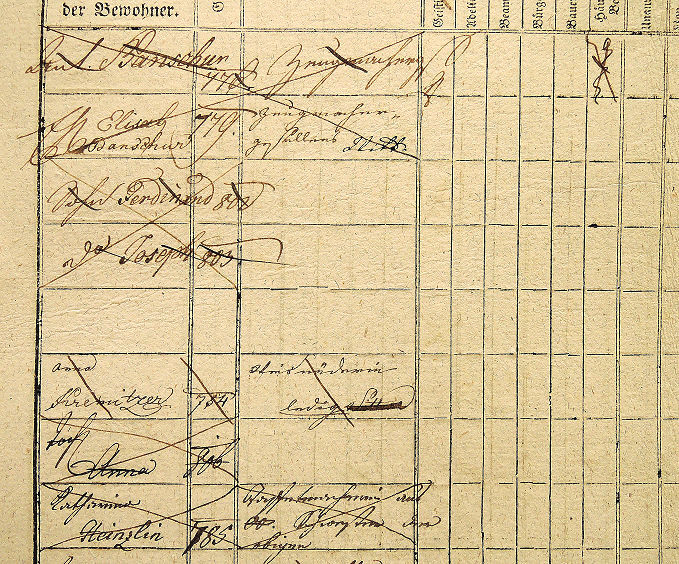 In 1830 Joseph Weidinger and his wife were registered by the conscription office at their address Leopoldstadt 108. On 26 January 1832 Joseph Weidinger's second child was born and christened Anton Karl two days later. The child's great aunt Magdalena Weidinger again served as godmother. The "nieder-oesterreichischer Landschafts=Trompeter" Joseph Weidinger died on 4 June 1832 at the young age of 34 of tuberculosis of the liver, a disease that he had probably contracted from his late mother. According to Joseph Weidinger's Sperrs-Relation he was survived by his wife Rosalia and his four-month-old son Anton whose guardianship was taken by "Anton Weidinger k.k. Hoftrompeter in der Josephstadt in dem Hause, wo die Bezirks Direction ist." This refers to the Josephstadt police headquarters which were located at Anton Weidinger's address, Strozzengrund No. 57 (today Strozzigasse 42). Joseph Weidinger left absolutely no assets. His clothing was sold to cover the medical expenses. His burial was paid for by his father. The title page of Joseph Weidinger's Sperrs-Relation. The note referring to Anton Weidinger''s guardianship and address is at the bottom (A-Wsa, Mag. ZG, A2, 1902/1832). Rosalia Weidinger survived her husband only by a little more than two years. She died of "Auszehrung" (consumption) on 23 July 1834 at Leopoldstadt No. 593 (today Obere Donaustraße 43). Surprisingly Anton Weidinger's grandson Anton Karl was not taken into the home of his grandfather, but was put into the orphanage on the Alsergrund. When Anton Karl died of "Fraisen" on 14 November 1834, he was described as "Zögling des k.k. Waisenhauses" (alumnus of the I. & R. orphanage). Anton Weidinger was born on 29 January 1800 at St. Ulrich 105 and baptized in the presence of Joseph Haydn at the Piarist Church of Maria Treu. Aeltern V. Anton Weidnger Weidinger Hof= / Trompeter. / M. Susanna geb. Zeißin. Anton Weidinger died on 25 October 1810 of "häutige Bräune" (diphtheria) (Maria Treu, Tom 7, fol. 166). Like his elder brother Joseph he certainly had received trumpet lessons from his father. Aloys Weidinger was born on 4 April 1801 at St. Ulrich 105 and baptized the following day at the Piarist Church of Maria Treu. Aloys Weidinger already died on 25 May 1801 of "Abzehrung" (emaciation) (Maria Treu, Tom. 6, fol. 58). Franz Thaddäus Weidinger was born on 11 March 1804 at St. Ulrich 105. On the occasion of the christening on the following day at the Piarist Church Haydn's cook Anna Kremnitzer stood proxy for her employer who was probably staying in Eisenstadt. Aeltern V. Anton Weidinger k. k. Hoftrompeter. / M. Susanna geb. Zeissinn. Taufpathen Joseph Hayden Kapellmeister / in dessen Namen Anna Kre= / mnitzerinn L.[edigen] St.[ands] Köchinn. Anna Kremnitzer had already substituted for Haydn on 14 Februar 1804 on the occasion of the baptism of Johann Elßler's daughter Anna Elßler at the parish church in Gumpendorf. Anna Kremnitzer, given as Haydn's substitute in the entry concerning Anna Elßler's baptism on 14 February 1804: "Anna Kremnitzer, Köchinn anstatt: H[errn] Joseph Haydn, fürstl. Esterhazzischer Kapelmeister" (Gumpendorf, Tom. 14, fol. 139). Franz Weidinger already died on 29 June 1804 of hydrocephalus (Maria Treu, Tom 6, fol. 155). The three-year gap between the births of Aloys and Franz Weidinger was caused by Anton Weidinger's concert tour in Germany, France and England. Carolina Weidinger was born on 14 April 1805 at St. Ulrich 105 and baptized the following day. Haydn's housekeeper Anna Kremnitzer again stood in for her employer. Aeltern V. Anton Weidinger k. k. Hoftrompeter / M. Susana geb Zeisinn. Carolina Weidinger died on 21 September 1805 of hydrocephalus. The death records of the Josephstadt parish erroneously list her as "Karl" Weidinger (Maria Treu, Tom 6, fol. 186). Ferdinand Weidinger was born on 8 May 1806 at St. Ulrich 105. Anna Kremnitzer again substituted Haydn at the baptism at Maria Treu. The child was very likely named after Anton Weidinger's close friend Ferdinand Kimm (1779-1835), a butcher in Gumpendorf. Ferdinand Weidinger died on 9 August 1806 of "Gedärmfrais" (intestinal cramps) (Maria Treu, Tom 6, fol. 213). Anton Elßler, a Godson of Haydn? Anna Kremnitzer's role as Haydn's proxy at the baptisms of three of Anton Weidinger's children puts her appearance as godmother for Johann Elßler's son Anton on 17 November 1806 in Gumpendorf into a different perspective. 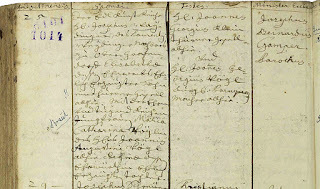 The entry concerning the baptism of Anton Elßler on 17 November 1806 with the description of the godparent: "Anna Gremnitzer, a housekeeper with Mr. Joseph Hayden" (Gumpendorf, Tom. 14, fol. 247). 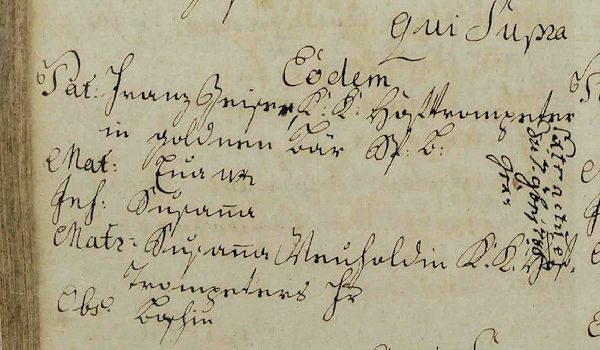 In Anton Elßler's baptismal entry Anna Kremnitzer is given as godmother, but the fact that she is explicitly described as "eine Wirthschafterin bey H[errn] Joseph Hayden" makes it seem possible that she actually stood proxy for the composer and the parish priest did not realize this circumstance. On 6 April 1808 Kremnitzer also served as godmother of Therese Elßler, but in the entry concerning this baptism Haydn's name does not appear and Kremnitzer is only given as "Wirthschafterin" (Gumpendorf, Tom. 15, fol. 30). Very little is known about Haydn's housekeeper Anna Kremnitzer and official Haydn scholarship has never done anything to change this. In paragraph 27 of Haydn's first will, dated 6 December 1801, she is bequeathed 1,000 gulden, a full year's income of 40 gulden, her bedclothes, furniture and several other items. According to an entry on a conscription sheet of Haydn's house Windmühle 84 she was born around 1750 and in 1805 was erroneously described as widow. In paragraph 41 of his second will, dated 7 February 1809, Haydn significantly increased Kremnitzer's inheritance. Since the translation in Robbins Landon's Chronicle is flawed, I present a corrected edition of this paragraph. Robbins Landon erroneously gives an amount of only 600 gulden and includes the bed which is not mentioned in the second will. That Anna Kremnitzer had lent Haydn 200 gulden which he gave back to her as a gift after his death, is obviously an error by the scribe. It was the other way around: Kremnitzer borrowed 200 gulden from Haydn and was forgiven her debt by her employer. Paragraph 41 of Haydn's second will concerning the bequest to Anna Kremnitzer (A-Wsa, Hauptarchiv, Persönlichkeiten H9/1, fol. 2r). Owing to many errors in translations of documents like this, Robbins Landon's Chronicle and Works is in desperate need of a revised and corrected new edition. 41tens: legire ich meiner treuen und rechtschaffenen Köchin Anna Kremnitzer Sech[s]tausend Gulden, wie auch das in ihrem Zimmer befindliche Bettgewand, worauf sie liegt, dann zweÿ Leintücher, 4 Seßeln, einen harten Tisch, dann harten Schubladkasten, die Repetiruhr, den Spiegel, das Muttergottesbild, einen Kreuzpartikel, das Begeleisen, das irdene Kuchelgeschirr sammt allen Kleinigkeiten von Kuchelgeräthschaften; nebst dem vermache ich ihr jene zweÿhundert Gulden, die sie mir [sic] in baaren Gelde dargeliehen hat. 41stly: I bequeath six thousend gulden to my faithful and honest cook, Anna Kremnitzer, as well as the bedclothes in her room on which she lies, then two sheets, 4 chairs, a hardwood table, then a hardwood cabinet with drawers, a repeater, the mirror, the picture of the Holy Virgin, the fragment of the True Cross, the iron, the earthen kitchenware together with all small pieces of kitchen utensils; apart from that I bequeath to her the two hundred gulden in cash that she lent me [i.e. that I lent her]. 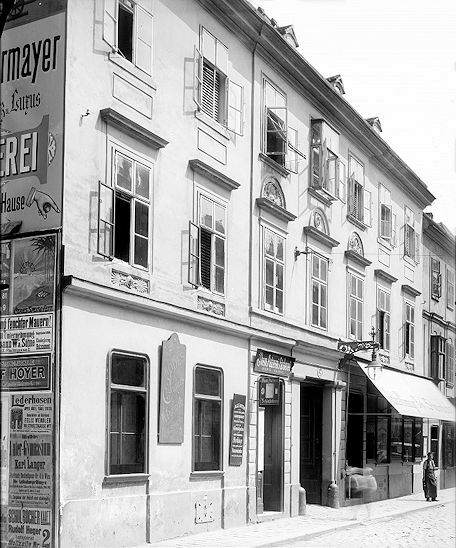 After Haydn's death Anna Kremnitzer's moved to Johann Elßler's house Gumpendorf 38 (today Hofmühlgasse 16) where she lived as a subtenant of the family of the harness maker Anton Bandschur. 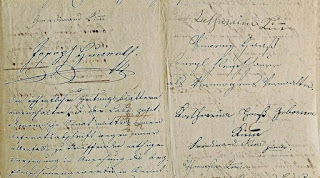 An entry in a conscription sheet of that house gives Kremnitzer's year of birth as 1754. Her status was first given as "Wittwe" which was crossed out and replaced with the note "ledig" (unmarried). Her profession is given as "Weisnäderin" (seamstress). Kremnitzer's relation to the Elßler family seems to have been much closer than that to her employer Haydn. On 23 June 1810 she engraved her name into Viennese local history when she officiated as godmother of Fanny Elßler who was to become Austria's most famous dancer. In the records Kremnitzer is given as "Anna Kremnitzin Weisnaderin". Kremnitzer's date of death is unknown. Since she had inherited 6,000 gulden from Haydn, she was able to move away from Gumpendorf. She did not die in the Gumpendorf parish. 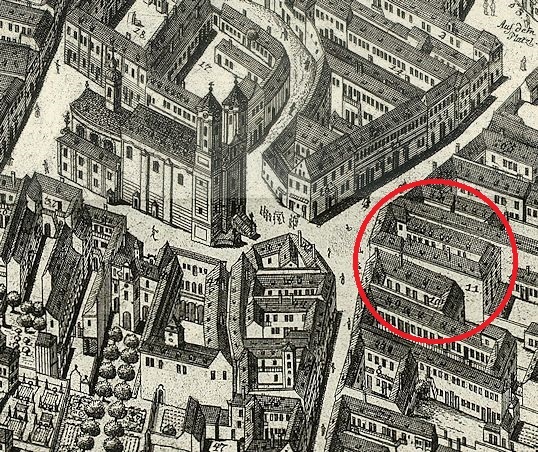 Soon after his wedding in 1797 Anton Weidinger moved from Josephstadt 124 to the house St. Ulrich No. 20 which was located at the "Platzl", right opposite St. Ulrich's Church. 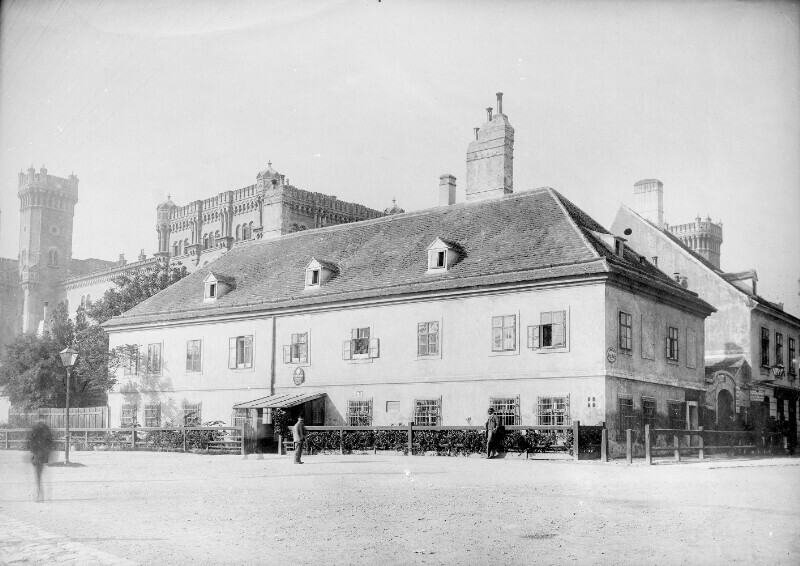 Anton Weidinger's residence in November 1797, St. Ulrich No. 20, "Zum schwarzen Adler" ("The black Eagle", today Neustiftgasse 22). Until 1795 this house bore the number 11. In this house, called "Zum schwarzen Adler", Anton Weidinger's first child was born on 2 November 1797 and baptized at St. Ulrich's with Elisabeth Weber substituting for the godmother Anna Haydn. That Haydn's wife was willing to serve as godmother of the first child of one of her husband's friends, is yet another proof that the estrangement between Haydn and his wife has been vastly exaggerated. Wohnung und Nro. des Hauses Platzl N° 20. im / zaunerisch[en] Haus. Namen der Getauften. Marianna Elisa= / beth. Vaters Namen und Kondition oder Karakt. Anton Weidin= / ger, im k. Theater / Trompeter. Mutters Tauf= und Zunamen. Susanna geb. Zeissinn. Stand. Kapellmeisters= / Frau. / Dienstmagd. The "Elisabeth Weber" who stood in for Frau Haydn is probably identical with the composer's former maidservant who in 1801 is mentioned as recipient of 300 gulden in paragraph 26 of Haydn's first will: "Der Rosalia Weberin, so bey mir in Diensten stand, welches sie schriftlich von mir aufzeigen wird 300 [fl]." Anton Weidinger's daughter Anna already died on 1 December 1797 of "Fraisen" (cramps). The entry concerning Anna Weidinger's death in the municipal death register. The child's age is given incorrectly and should read "4 Wochen" (A-Wsa, TBP 107, W, fol. 27v). Weidinger Mr. Anton I. & R. court theater trumpeter, his child Anna was inspected at the Black Eagle No. 20 at St. Ulrich as having died of cramps at 10 a.m., aged 4 months[sic]. Pibitz. The court trumpeter Anton Weidinger is one of the most legendary representatives of his profession, because he was a pioneer of the keyed trumpet which he technically improved and in 1801 had patented, after he had already submitted his invention for a patent in March 1800. Haydn's trumpet concerto was written for this instrument which represented a transitional phase in the development of the chromatic trumpet. What does the existing Weidinger literature tell us about this musician? 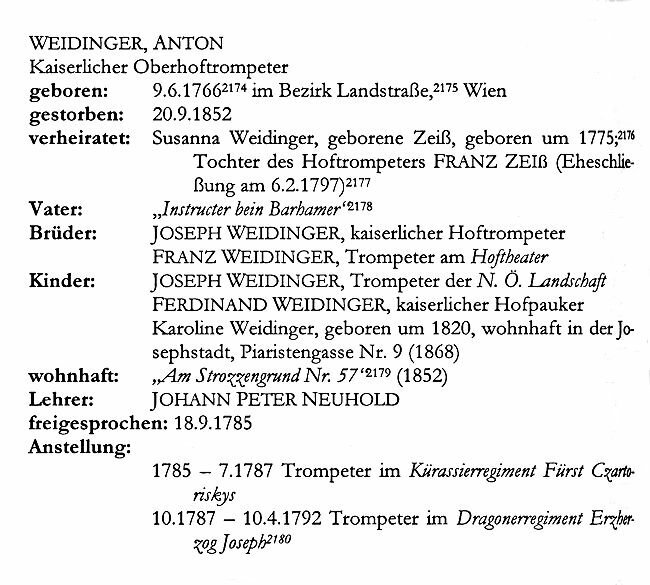 In his 1993 master thesis, titled Anton Weidinger (1766-1852), Andreas Lindner primarily recounted the history of the trumpet in the late eighteenth century, mistakenly applying J. E. Altenburg's statements in his 1795 Versuch einer Anleitung zur heroisch-musikalischen Trompeter- und Pauker-Kunst to the situation in eighteenth-century Vienna. As far as Weidinger's biography was concerned, Lindner just repeated the information from Heuberger's old article and copied all available documents in the holdings of the Obersthofmeisteramt related to Weidinger's employment at the Vienna court. Concerning Weidinger's life between 1804 and 1810 Lindner writes: "Zwischen den Jahren 1804 und 1810 sind kaum biographisch bedeutende Informationen greifbar" ("Between 1804 and 1810 hardly any relevant biographical information is available. ", Lindner 1993, 77). Receiving no competent advice at all from his supervisor, Lindner limited his research to the Haus-, Hof- und Staatsarchiv and ignored all other archives where he would have found useful information concerning Weidinger's family life. In 1999 Lindner published his dissertation titled Die kaiserlichen Hoftrompeter und Hofpauker im 18. und 19. Jahrhundert which received the following overexcited praise from Edward H. Tarr: "It is impossible to give a critical review of this book, for a reviewer will repeatedly lapse into applause and tirades of praise. Andreas Lindner, all historically interested trumpeters are in your debt for having provided us with this thorough and perceptive book. It is every bit worth its prince[sic], and I hope that many scholars, institutions, and libraries will order it." Tarr was certainly not in a position to judge the quality of Lindner's research. Because Lindner only consulted one section of one single Vienna archive and even ignored the documents of the Obersthofmarschallamt that are held in the same building, his book is comparable to a one-legged giant limping in circles. This "thorough book" consists of nothing but transcriptions of hundreds of (mostly redundant, sometimes irrelevant) documents from the Obersthofmeisteramt that accumulate hundreds of transcription errors in 846 pages. The documents are presented without any context or the necessary information concerning the musicians' biographies, their family relations and social interactions. Most of the musicians are listed with no biographical data except their year of death and even a cursory comparison of the information from the Obersthofmeisteramt with the Vienna parish records shows that most of Lindner's data are false. To turn Lindner's book into a useful piece of work it would need a complete revision and the addition of a second volume containing all the missing biographical information. With two wives Anton Weidinger fathered thirteen children of whom six were godchildren of Haydn. Burying himself in the holdings of the Obersthofmeisteramt, Lindner never even came close to uncovering these facts. In Lindner's "thorough and perceptive book" Weidinger ends up with only one wife and only three children. A section from p. 554 of Lindner's book on Viennese court trumpeters. It is notable that Lindner is unaware of Wurzbach's 1886 article, that Lindner's source for the place of Weidinger's birth and the date of his wedding is still Heuberger and that Weidinger's father has no name. It is telling that Lindner's two publications are neither listed in Reine Dahlqvist's entry in New Grove nor in the bibliography of Ulrich Wilker's article on Weidinger in Laaber's 2009 Haydn-Lexikon. In the main series of the new edition of the MGG encyclopedia Anton Weidinger was ignored and only received an article in the supplement. The state of knowledge concerning the actual technical design of Weidinger's keyed trumpet is still surprisingly fragmentary. None of the aforementioned authors, for instance, ever became aware of the fact that Weidinger's patented trumpet had seven keys. Lindner describes Anton Weidinger's father as "Instructor bein Barhamer" (adding no usable information in his footnote), but he has no idea what this means. Ignaz Parhamer (1715-1786) was the head of the Waisenhaus Unser lieben Frau am Rennweg where from 1764 until at least 1768 (the year his daughter Maria Hedwig was born on 1 April at the Vienna orphanage) Anton Weidinger's father Joseph was employed as trumpet teacher of the orphanage's noted musical forces. Hence Anton Weidinger's first teacher was not Peter Neuhold, but his own father at a much earlier time. 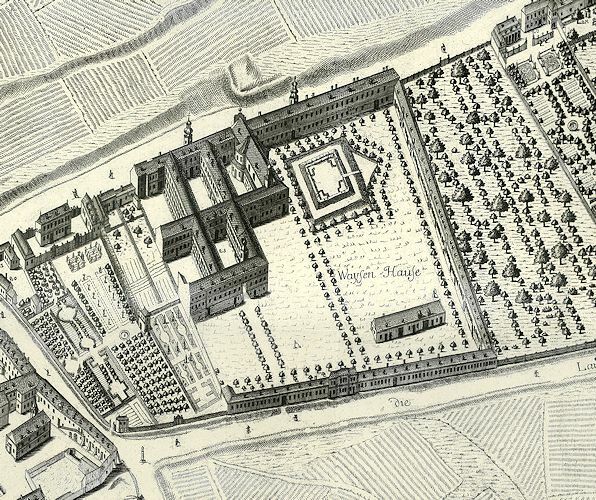 Anton Weidinger's place of birth, the Waisenhaus am Rennweg on Joseph Daniel von Huber's 1778 plan of Vienna. The title page and page 10 of the Vollkommener Bericht von dem MUSIC-Chor deren Knaben in dem Waysenhaus Unser Lieben Frauen auf dem Rennweg from 1764 (with thanks to David Black for providing this document). Joseph Weidinger is listed as trumpet teacher at the lower right. 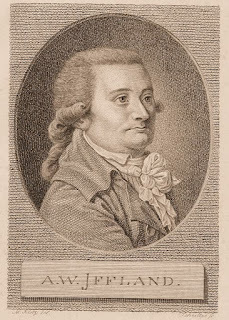 His colleague Johann Georg Heinisch (b. 19 November 1719 in Stružnice) was a younger brother of the legendary trumpeter Johann Wenzel Hainisch (b. 9 May 1708 in Stružnice). The name "Johann Baptist" Hainisch given by Lindner and Harten is false. The encyclopedic literature about Hainisch is mostly based on guesswork and misinformation (Uwe Harten, Art. "Hainisch (Hanisch), Johann Baptist", in: Oesterreichisches Musiklexikon). A clip from the report in the Wiener Diarium of 10 December 1768. For more information on musical practice at the Waisenhaus see: David Black, "Mozart and Musical Discipline at the Waisenhaus", Mozart-Jahrbuch 2006, 17-33. On both sides outside the church all the house companies paraded with their field music, including three choirs of trumpets and timpani. The reception of Her I. & R. Majesty and the four royal Highnesses by His Princely Eminence the cardinal of the Roman Church and the local archbishop took place at the main entrance of the above-mentioned church with the attendance of the complete clergy, accompanied by the joyful sound of trumpets and timpani. Anton Weidinger's father Joseph Weidinger was born on 2 January 1723 in the hamlet Willersdorf near Ober-Grafendorf in Lower Austria, son of Lorenz Weidinger and his wife Elisabeth. 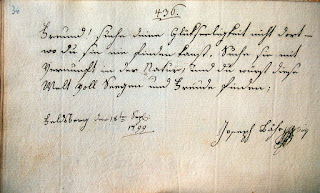 The entry concerning the baptism of Joseph Weidinger on 2 January 1723 in St. Joseph's in Ober-Grafendorf (Ober-Grafendorf, Tom. 1/4, 144). Weidinger's godfather was Simon Huzinger from Wantendorf. On 25 June 1749, in the church of St. Othmar in Mödling, Joseph Weidinger married Maria Catharina Vögl, daughter of Johann Augustin and Regina Vögl from Mödling. At that time Joseph Weidinger was registered as "Thurner Gesell", i.e. an apprentice of the Thurnermeister, the head of the municipal band. The entry concerning the wedding of Anton Weidinger's parents on 25 June 1749 in the church of St. Othmar in Mödling (Mödling, St. Othmar, Tom. 3, 1014). Joseph Weidinger's best man was his fellow "Thurner Gesell" Johann Georg Klein, the father of the clarinetist Johann Georg Klein (1754-1832). Joseph Weidinger, music instructor of long-standing merit at the k.k. Waisenhaus, died of a stroke on 2 November 1784 at the Waisenhaus and was buried gratis two days later in the St. Marx cemetery. 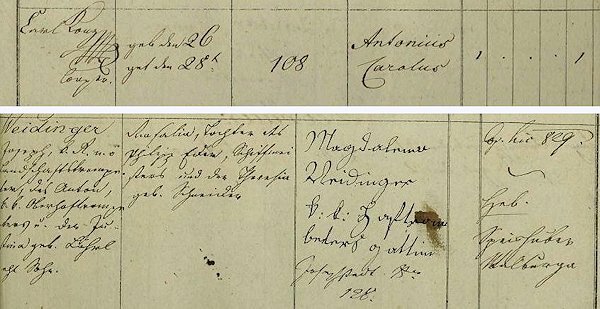 The 1802 marriage entry of Joseph Weidinger's son Franz (d. 25 June 1814) in the parish records of Altlerchenfeld also documents his father's early activity as "Thurnersgeselle" in Mödling: "Franz Weidinger Trompeter im k:k: Hoftheater von Mödling geb. Thurnersgesellens = Sohn". The age given in Franz Weidinger's marriage entry is correct, the one given in the announcement of his death in the Wiener Zeitung is wrong. 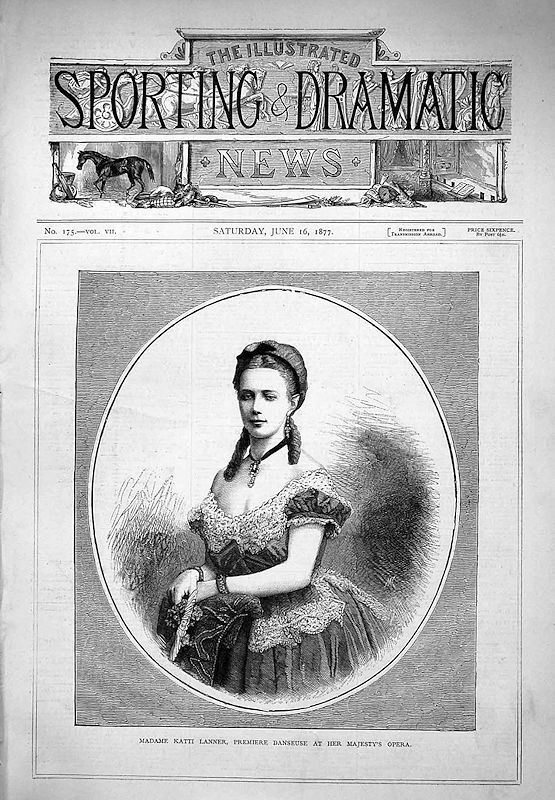 Franz Weidinger's bride was Katharina Baumgartner (b. 21 December 1772), the daughter of a Fragner in Neubau. The entry concerning the wedding of the trumpeter at the court theater Franz Weidinger (Anton's elder brother) on 18 August 1802 with a reference to his father's profession "Thurnersgeselle" (Altlerchenfeld, Tom. 2, fol. 44). Josephus Weidinger, ein Instructor in Waÿsen = Hauß. The entry concerning Anton Weidinger's baptism in the Waisenhauskirche in Erdberg (A-Wd, Tom. 86, fol. 199r). Enviably ignorant of the Weidinger literature Edward H. Tarr, in his article "The trumpet before 1800", writes: "Dahlquist and Lindner were the first to discover that Weidinger had been born in 1766, and not in 1767, as can be read in every reference work." (Tarr 1997, 313). As stated above, Weidinger's exact date of birth was first published in 1886 by Wurzbach. In the course of my search for Anton Weidinger's marriage contract (bearing Haydn's signature) I was able to find Weidinger's application to his bride's superior guardian, the Vienna City Council, to grant Susanna Zeiss the necessary "Eheconsens" (marriage permit). Her immediate guardian was the retired court trumpeter Peter Neuhold (1721-1801) whose consent was also essential for the marriage. Although it is usually a part of such a file, Weidinger's application does not contain his marriage contract. Since the entry concerning the court's final decision on 12 January 1797 explicitly refers to the couple's future acquisitions as having to become shared property (a clause that was normally part of a marriage contract), it seems likely that Weidinger never actually submitted his marriage contract to the civil court. A part of the cover sheet of Anton Weidinger's application referring to the final resolution (A-Wsa, Mag. ZG, A3, 1049/1796). In agreement with the guardian, the City Council wants to grant a permit to the minor Susanna Zeis to marry Anton Weidinger under the condition that everything the bridal couple will acquire in the future should be considered shared property, and that both parties submit a signed list of their current belongings on paper, bearing the appropriate revenue stamp. By the way this application has to be kept on file and the bridal couple is to be informed of the resolution. Ex Consilio Magistrati 12 January 1797. Spielvogl. The resolution was forwarded on 16 January 1797. Spv. The list of Anton Weidingers belongings, signed by himself, shortly before his wedding (A-Wsa, Mag. ZG, A3, 1049/1796). Of the complete assets consisting of furniture, clothing and other items which by order of the honorable City Council was herewith drawn up by their owner Anton Weidinger. –– Annual salary as trumpeter at the I. & R. German theater of 250 f.
Of linen 6 shirts, 6 pairs of socks, a dozen handkerchiefs plus a few more similar trifles p.p. trumpeter in the I. & R.
The list of Susanna Zeiss's belongings shortly before her wedding, signed by Zeiss and Peter Neuhold (A-Wsa, Mag. ZG, A3, 1049/1796). Of the complete assets consisting of furniture, clothing and other items which by order of the honorable City Council was herewith drawn up by their owner Susanna Zeiß. Vienna 12 January 1797. [L.S.] Peter Neuhold I. & R.
Weidinger's first wife Susanna Zeiss was born on 13 March 1775 in the house Spittelberg No. 40, "Zum goldenen Bär" ("The golden Bear", today Kirchberggasse 7), the second child of the court trumpeter Franz Zeiss (Zeise) and his wife Eva, née Schmid. Susanna Zeiss's godmother was Susanna Neuhold, the wife of the court trumpeter Peter Neuhold. The entry concerning the baptism of Susanna Zeiss (St. Ulrich, Tom. 34, fol. 194v). The vertical entry on the right refers to the issuance of a baptismal certificate on 7 November 1786 on the occasion of the appointment of Neuhold as the orphan girl's guardian. Susanna Zeiss's parents had married on 27 July 1773 at St. Ulrich's, soon after Franz Zeiss had been appointed court trumpeter. At that time he was living at the Belvedere. His bride was Eva Schmid, the daughter of a master shoemaker from Vienna. Franz Zeiss's and Eva Schmid's 1773 marriage entry: "Franz Zeisse, a bachelor, Imperial trumpeter, residing at the Belvedere on the Rennweg, born in Reichenau in Silesia" (St. Ulrich, Tom. 27, fol. 287v). All these children were born at "The golden Bear" on the Spittelberg, and their joint godmother was Susanna Neuhold. The court trumpeter Franz Zeiss already died on 28 November 1783 of "Lungengeschwüre" (lung ulcers) at Landstraße 328 (today Landstraßer Hauptstraße 7). Unfortunately his probate file (Mag. ZG, A2, 342 1/2/1783) is not extant. Eva Zeiss died on 29 October 1786 at the Allgemeines Krankenhaus of "Faulfieber" (gangrenous fever) (A-Wsa, TBP 87, Z, fol. 15v). Because of her poverty the City's civil court did not even draw up a probate file. After her mother's death a guardian had to be appointed for the eleven-year-old Susanna Zeiss, and the authorities chose the husband of the girl's godmother, Peter Neuhold to take on this task. On 30 September 1786, Susanna Zeiss's new guardian submitted a table of expenses for his ward to the civil court of the Vienna City Council. The file pertaining to this procedure (Mag. ZG, A3, 974/1786) is not extant. The only source concerning Neuhold's appointment is the following entry in the court protocol. 27459 Zeisse Susana, ihr Gerhab Peter Neuhold, k:k: Hoftrompeter überreichte die Pupilartabell den 3. 7ber 786. [Fasz.] 3. [Numerus] 974. Daß Haydn seine Sympathie für den Erfinder auch in das Privatleben übertrug, beweist der Umstand, daß der berühmte Meister bei der am 6. Februar 1797 in Wien stattgehabten Vermählung Weidingers mit Susanna Zeissin, Tochter des Trompeters Franz Zeiss und dessen Ehefrau Eva geb. Schmidin als Trauzeuge erschien. That Haydn transferred his sympathy for the inventor also to the private life is proved by the fact that the famous master appeared as witness at Weidinger's wedding with Susanna Zeiss, daughter of the trumpeter Franz Zeiss, which took place on 6 February 1797 in Vienna. Anthony van Hoboken misunderstood this passage as referring to the wedding of one of Weidinger's daughters and H. C. Robbins Landon, in his Haydn Chronicle, and Otto Biba in the 1982 Haydn exhibition catalog duly repeated this error. Because Heuberger did not specify whose witness Haydn actually was, all authors have to resort to vague statements regarding this issue. In the forword of their 1985 edition of the trumpet concerto Makoto Ohmiya and Sonja Gerlach write: "Haydn war Trauzeuge bei Weidingers Hochzeit", a blurry statement that Ulrich Wilker repeats in Laaber's Haydn-Lexikon. In his dissertation Lindner writes with symptomatic reluctance: "Als Trauzeuge wird Joseph Haydn genannt" (Lindner, p. 554). No Haydn scholar had ever bothered to check the actual entry in the records of the Gumpendorf parish, when in March 2011 I finally visited the parish office and took pictures of Weidinger's marriage entry. Haydn was not Weidinger's best man. He officiated as witness of the orphan bride Susanna Zeiss who was living in Haydn's house in the Steingasse. Namen und Stand. Anton Weidinger. Lediger Trompeter / im K:K: Theater. Gebürtig von hier. / Des Joseph Weidinger Instruktors, und Katha= / rina, geb: Vöglin. Dessen Ehg:[attin] Beeder sel:[ig] / ehl:[iger] Sohn. Anmerkungen Bräutigam hat den Entlas / von Mili= / tär, und Braut den obergerhabl[ichen] / Consens gebracht. Weidinger's best man, Nikolaus Imelsky, was born around 1740 and was a municipal customs official. He seems to have been an acquaintance of Anton Weidinger's father which is suggested by the following two facts: 1) At the time of his wedding on 16 February 1772 (A-Wd, Tom. 66, fol. 179r), Imelsky was employed as "K:K: Mauth und Aufschlags Gegenhandler auf dem St. Marxer Posto" (toll and surcharge administrator at the St. Marx customs station) which was located near the Waisenhaus am Rennweg; and 2) In 1799 Imelsky's daughter Elisabeth (born 1 March 1777) was a maidservant in the service of "Herr v[on] Waldmann, Postamtsbuchhaltereybeamter" who was a brother of Anton Weidinger's godfather. After serving at St. Marx, Imelsky in 1776 was transferred to the toll and customs station Am Tabor 93 in the Leopoldstadt. From the early 1780s on he served as customs official for water transported goods at the so-called "Lampelmaut" in the Rossau where he died on 26 July 1799. What makes Haydn's providing lodging to Susanna Zeiss especially intriguing is the fact that Susanna Neuhold owned the house Gumpendorf No. 80 (last numbering 83, today approximately Mollardgasse 38). Susanna Neuhold listed as owner of Gumpendorf 62 in Joseph Maximilian Fischer's Verzeichniß der in der Kaiserl. Königl. Haupt- und Residenzstadt Wien, sammt dazu gehörigen Vorstädten und Gründen, befindlichen numerirten Häusern, bey Joseph Gerold (Vienna 1786), p. 81. Susanna Neuhold, née Ganaus had inherited this house from her first husband Carl Veigl, a sculptor at the University of Vienna who had died on 20 July 1770 in Gumpendorf. Haydn must have had a close relation to the orphan Susanna Zeiss and for some reason was possibly in her parents' debt. On the other hand, it must also be noted that both Peter and Susanna Neuhold were older than Haydn and were possibly unable to take care of their ward. Peter Neuhold died on 19 November 1801, his wife Susanna on 26 May 1808. I have delved deeply into Peter Neuhold's biography (basically doing the research that Andreas Lindner failed to do), but the topic of Neuhold's life will have to be dealt with in a future blogpost. Susanna Weidinger's marriage did not legally change her status as a minor. After she had turned twenty-four in March 1799, her guardian Peter Neuhold still had to apply to her superior guardian (i.e. the Vienna Magistracy) to grant her the status of legal majority. Since my ward Susanna Weidinger, née Zeiss according to the enclosed baptismal certificate A. has completed her minority and at all times has behaved reasonably and honest in such a manner that from this party nothing bad can be brought forward against her, the undersigned requests to declare her a major and grant a resolution that is necessary in this case. Anton Weidinger's first wife Susanna died on 31 August 1807 of tuberculosis. According to Susanna Weidinger's Sperrs-Relation her belongings were estimated at 101 gulden, but this sum was exceeded by the costs of the medical treatment which amounted to 255 gulden. A probate file in the holdings of the court of the Schottenstift, in whose patrimonial jurisdiction the house St. Ulrich 105 was located, normally contains the will or the marriage contract of the deceased person. 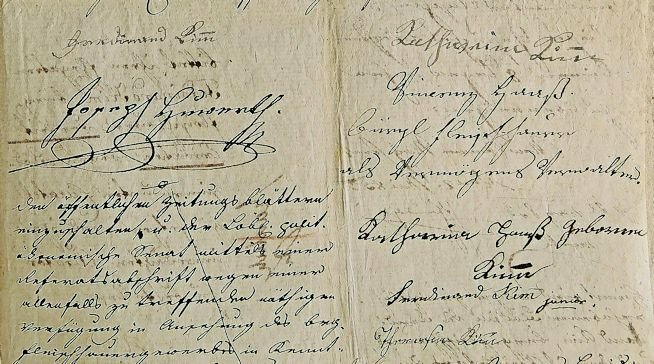 Susanna Weidinger's marriage contract – bearing Haydn's signature – is missing from the probate file and is referred to as "being located in the municipal registry". The contract is not recorded in the protocol of the City's civil court and for unknown reasons never reached the court of the Schottenstift. Susanna Weidinger's marriage contract seems to have already gone missing in 1807. Minor children and their whereabouts. two. 1 Joseph, aged 8 years 2 Anton aged 7 years, both at the place of death with their father. Whether there is a will a marriage contract which was concluded at the City Council by the deceased as ward according to the law with the approval of the superior guardian. Its whereabouts in the municipal registry. In her will, dated 2 September 1806, Susanna Neuhold had bequeathed a bank bond worth 300 gulden to Susanna Weidinger, but since she survived her goddaughter by almost nine months, this bequest never had to be handed over. Eighthly: To my godchild Susana Weidinger, wife of an I. & R. court trumpeter, I bequeath a five per cent bank bond of three hundred gulden. Susanna Weidinger was buried on 1 September 1807 in the Schmelz cemetery. When in 1907 Richard Heuberger interviewed Anna Weidinger, he was shown Anton Weidinger's original certificate of apprenticeship which was issued on 18 September 1785 and signed by Weidinger's principal teacher Peter Neuhold and five representatives of the Vienna trumpeters' guild. Fortunately Heuberger published the complete text of this document whose current wherebouts are unknown. In his 1993 thesis Lindner writes: "Heuberger refers to original documents whose inspection was made possible by the widow of Ferdinand Weidinger, a grandson of Anton Weidinger. Because these documents are in private property today, they could not be examined." This does not mean that Lindner ever searched for these documents. He simply did not know how to look for them. They are neither held by the archive of the Gesellschaft der Musikfreunde, nor by any other Viennese library or public institution. The search for these valuable sources leads into an investigation of the descendants of Anton Weidinger's second family. Some of these children will be dealt with in a future blogpost which will be dedicated to their godparents Ferdinand and Katharina Kimm. Anton Weidinger's family on an 1830 conscription sheet of the house Strozzengrund 57 (today Strozzigasse 42). Later entries include the notes "gestorben", referring to the parents. Ferdinand was "verh[eiratet]", started out as "Graveur" and in 1838 was "zu klein" for the military. Johann began as "Polytechniker" and in 1845 was "zu schwach" to be drafted. Maria is noted as married and the "Schwager des obigen" and "n. oest. Landschaftstrompeter" Ferdinand Maurer (b. 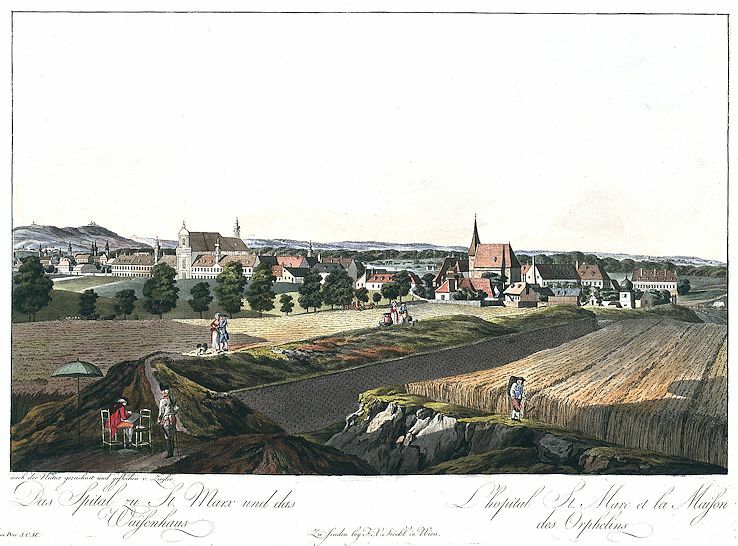 7 May 1801) was a son of Justina Lehrl's sister Barbara and of Daniel Maurer, Anton Lehrl's successor as schoolteacher and sexton in Gumpendorf (A-Wsa, Konskriptionsamt, KB Strozzengrund 57). Anton Weidinger's second wife Justina died on 11 October 1850 of "Wassersucht" (dropsy). Anton Weidinger officially retired as court trumpeter only in 1850, when according to a medical certificate he was already "frail and completely deaf". His retirement had been delayed for decades with the help of substitutes who were cheaper than the appointment of a successor. Weidinger, who survived two wives, eleven of his thirteen children and two of his three grandchildren, died on 20 September 1852 of old age and was buried two days later in the Schmelz cemetery. The entry concerning Anton Weidinger's death and burial. The word "Versehen" refers to the last rites that Weidinger received (Maria Treu, Tom.12, fol. 231). Owing to the destroyal of all probate records of the Josephstadt district court from between 1850 and 1898 during the July Revolt of 1927, Anton Weidinger's probate file is not extant. Weidinger's son and main heir Ferdinand started out as an engraver apprentice, but eventually became a timpanist, first at the Theater in der Josephstadt, then at the Theater an der Wien. Ferdinand Weidinger's family on an 1850 conscription sheet of the house Strozzengrund 57 (A-Wsa, Konskriptionsamt, KB Strozzengrund 57). Ferdinand had married Aloisia Katharina Rosalia Kaspar (b. 22 April 1821) on 12 November 1848 (Maria Treu, Tom. 9, fol. 205). After starting service as "Exspektant", in 1848 Ferdinand Weidinger joined the orchestra of the court theaters in 1851 and in 1855 he became a fully employed I. & R. Court timpanist. His only son Ferdinand Rudolph Alois, who was born on 22 September 1849 (Maria Treu, Tom. 26, fol. 82), broke with the family tradition and became a cellist and pianist. He also became a member of the Hofkapelle and the Hofoper, gave a lot of public concerts and arranged a number of popular concert pieces for cello of which some were preserved by his pupil Josefine Donat (1867-1936) and survive in the music collection of the Austrian National Library. 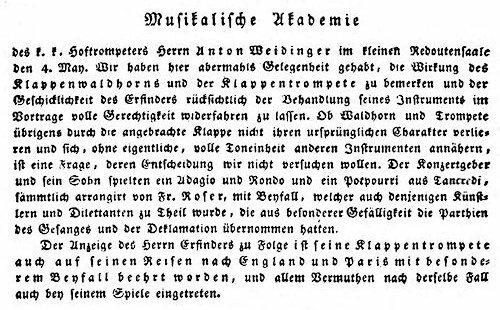 The first page of Ferdinand Weidinger the younger's first employment contract as cellist with the k.k. Hof-Operntheater-Direktion for the time from 1 September 1869 until 31 August 1870. 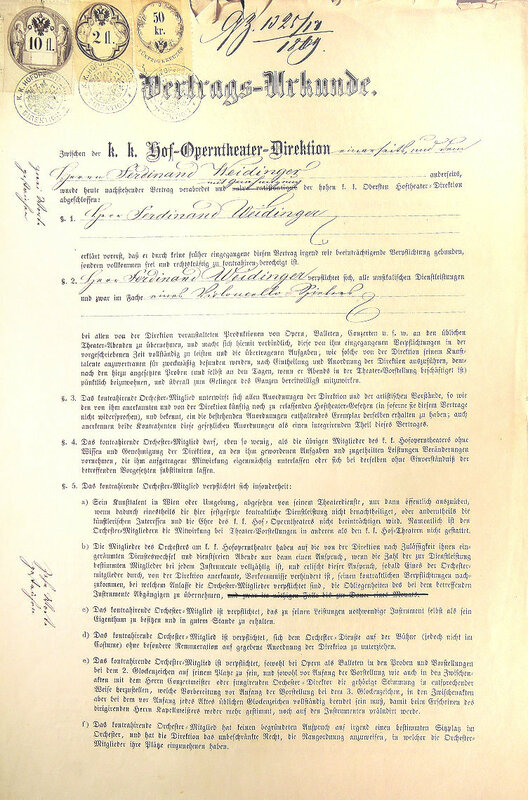 This contract was signed on 9 September 1869 by Weidinger and the then head of the court opera Franz von Dingelstedt. Weidinger's annual salary was 420 gulden (A-Whh, HA Oper SR 72-100). When his father died in 1895, Ferdinand Weidinger the Younger inherited his grandfather's papers which after his death on 10 March 1898 (Maria Treu, Tom. 20, fol. 17), according to his will written on 23 February 1898, went to his widow Anna Weidinger. Anna Weidinger, who in 1907 had still been in possession of Anton Weidinger's certificate of apprenticeship, died on 6 November 1911 of uterine cancer at the Maria-Theresia-Frauen-Hospital (today Feldgasse 9) (Maria Treu, Tom. 22, fol. 244). In her will, dated 24 May 1904, she requested to be buried in the grave of her husband and her father-in-law and bequeathed an amount of 600 kronen to the City of Vienna "for the preservation of this grave for perpetual times". Accordingly this grave was granted the status "auf Friedhofsdauer" (preservation for the time of existence of the cemetery). The grave of Anton Weidinger's son Ferdinand (1818-1895), his grandson Ferdinand (1849-1898) and his granddaughter-in-law Anna Weidinger (1855-1911) is located in group 48B (1/38) of Vienna's Zentralfriedhof. The tombstone of this grave will at some time eventually tumble northwards and no institution in the "Music Capital of the World'" will be willing to pay for its restoration. Anna Weidinger's sole heir was her sister. The fact that this sister was unmarried and had no children makes it rather unlikely that Anton Weidinger's original documents survived. My research in this matter is still ongoing. 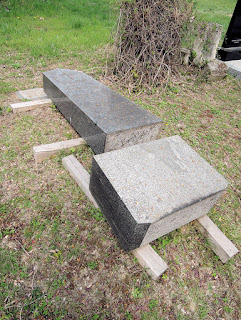 Just as I predicted in March 2015, the stone of the abovementioned grave of the Weidinger family has since been taken down for security reasons and laid on the ground behind its base. 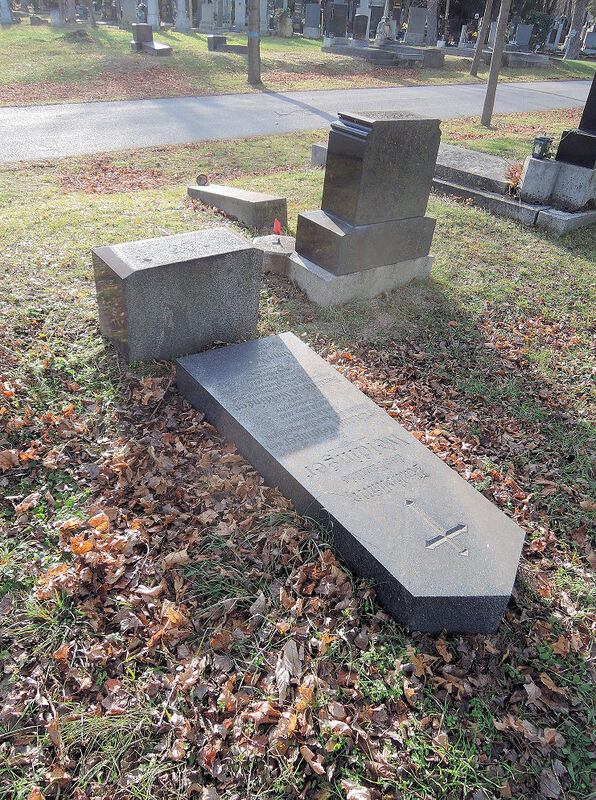 It will be interesting to see if the City of Vienna will acknowledge her legal obligation to take care of this grave and whether the Vienna Philharmonic Orchestra will be willing to contribute to the restoration of the grave of two of this orchestra's former members. In December 2017, via a member of the orchestra, a colleague cellist who is an old acquaintance, I contacted the Vienna Philharmonic Orchestra and informed them of the destroyed state of the grave of two of their more prominent nineteenth-century members. The orchestra's management allegedly brought the issue up at a board meeting, but eventually decided not to have the grave restored. The VPO, which, according to numerous sources, is awash with money, obviously does not want to set a precedent by taking care of the Weidinger family grave. The VPO's management is afraid that the orchestra may be overrun by more request to take care of graves of its deceased members. Heuberger, Richard. 1908. "Anton Weidinger Biographische Skizze". Die Musik 7. Jg., 1907-08, 4. Quartal, Bd. 28: 162-66. Dahlqvist, Reine. 1975. The keyed Trumpet and its greatest virtuoso, Anton Weidinger. Nashville, Tenn: The Brass Press. Brass Research Series 1. Landon, H. C. Robbins. 1977. Haydn: Chronicle and Works. The late years 1801-1809. London: Thames & Hudson. Gerlach, Sonja and Ohmiya, Makoto, 1985. Joseph Haydn Werke III/33, Konzerte für ein Blasinstrument und Orchester (Joseph Haydn-Institut Köln). München: Henle. VIII-X. Lindner, Andreas. 1993. Anton Weidinger (1766-1852). Master's thesis, University of Vienna. –––––––. 1999. Die kaiserlichen Hoftrompeter und Hofpauker im 18. und 19. Jahrhundert. Tutzing: Schneider. Raab, Armin. Siegert, Christine. Steinbeck, Wolfram (eds.). 2009. Das Haydn-Lexikon. Laaber: Laaber-Verlag. Tarr, Edward H. "The trumpet before 1800", in: Herbert, Trevor. Wallace, John (eds). 1997. The Cambridge Companion to Brass Instruments. Cambridge: Cambridge University Press, 103-22. Wurzbach, Constant von. 1886. "Weidinger, Anton", in: Biographisches Lexikon des Kaiserthums Oesterreich, vol. 53. Vienna: k.k. Hof- und Staatsdruckerei, 258f.